Since March 2016, the Uffizi Gallery will host an exhibition titled \"Fece di scoltura di legname e colorì. 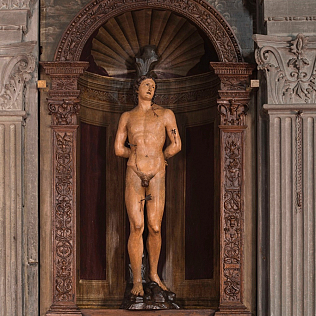 The wooden painted sculpture of the fifteenth century in Florence\", curated by Alfredo Bellandi. In the first half of the fifteenth century - a very important century for Florentine and Italian art - painted sculpture in wood, marble or terracotta represented the primacy of this art. The exhibition aims to introduce visitors to the Florentine artistic environment of that time. The masters and their workshops worked neighbors, stealing and exchanging secrets and news each other, in a fruitful and innovative climate. For the first time, approximately 50 works will be exhibited together to investigate this noble art, which in Florence reached very high levels. The exhibition will be open from 21 March to 28 August 2016 at the Uffizi Gallery.